Sensor head 32 mm 1.260 in type has been added since March, 2017. The slim unit body contains plain bearings with 2-point support structure disperses load and achieves superb durability. The sensor head offers long life and reduces maintenance costs dramatically. Value on the HG-S1010 / HG-S1110. 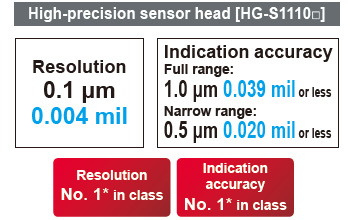 Value on the HG-S1010(R) / HG-S1110(R). The accuracy and robustness of the HG-S series are backed by master craftsmanship. The plain bearings are accurately aligned with the center of the spindle during their installation to the top and bottom sections of the body to ensure smooth sliding. This process involves careful adjustment of each bearing by a skilled worker. Even though the plain bearing has a certain width, the clearance is managed to the accuracy of several μm. Those with experience in mechanisms design will know that this value signifies amazingly high control precision. The high-precision, robust sensor is made possible by master craftsmanship. Maximize the high accuracy of our sensors in your pursuit of "ever higher levels of quality." A new structure supports the spindle with upper and lower plain bearings to significantly increase rigidity. Unlike ball bearings, these bearings efficiently disperse lateral loads on the spindle, significantly reducing the risk of breakage. 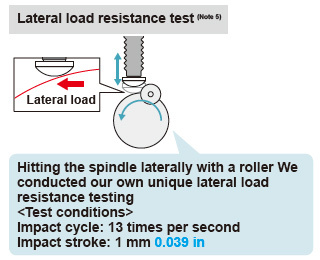 Spindle whirl-stop is accomplished by means of a metal guide requiring a several μm level assembly precision. Unlike a plastic guide, the risk of measurement error and glass scale breakage caused by deformation, wear, and other deterioration is significantly reduced. Button-type probe for evaluation purposes was installed on the test sample for the lateral load resistance test. No "value skipping" or "unset zero point"
Displacement is measured by reading a glass scale with a different slit pattern at each reading position using a high-resolution sensor. 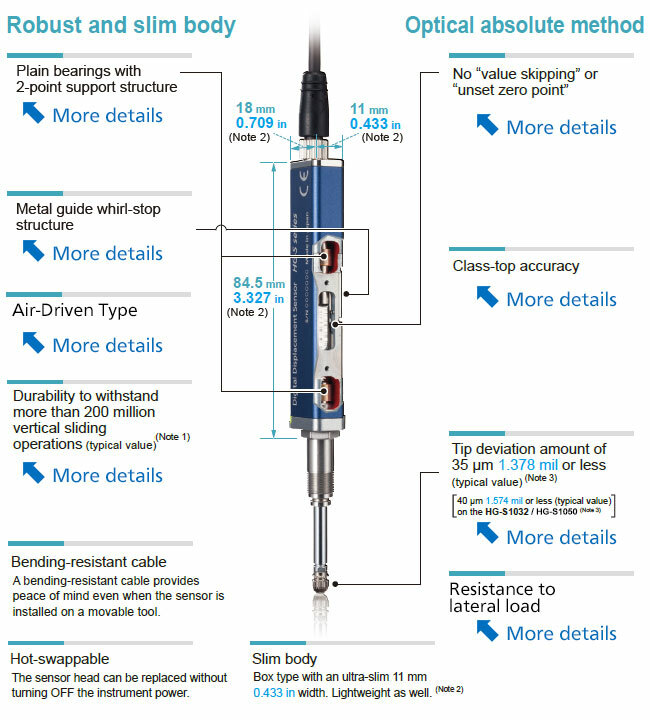 This eliminates "value skipping" even when measuring at high speed, and there is no concern of "unset zero point". * As of January 2017, according to our survey. 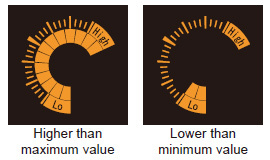 Tip deviation, which impairs measurement accuracy, is minimized. The precision with which the HG-S series is assembled makes this possible. * Less than 40 μm 1.574 mil on the HG-S1032. 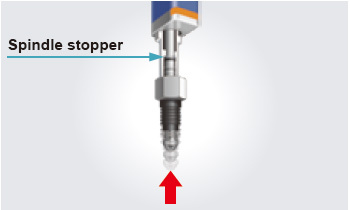 Even if unexpected upward thrust occurs, the lower part of the spindle blocks the impact. Damage to the internal structure, including the glass scale, is minimized. 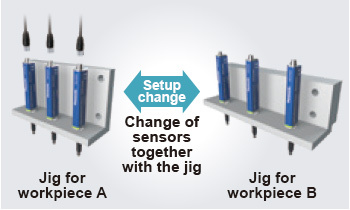 The sensor head can be changed safely without turning off the controller. This reduces the man-hours required for the change of line setup for processing of different workpieces, thus achieving a significant reduction of setup change time. functions and excellent ease of use. It allows simple and reliable operation of the advanced measurement function in a diversity of applications. The following data are stored and can be used for analysis on the spot. Alarm can be set to notify an upward thrust (stroke) that exceeds the set level. This allows you to conduct a preventive maintenance before the sensor head generates a malfunction. The 2-line digital display simultaneously shows sensor head measurement and judgment value. The 2-line digital display simultaneously shows head measurement (measured value) and judgment value (calculated value). Values between allowable maximum and minimum values are indicated in green. Values outside of the allowable range are indicated in orange. This provides at-a-glance understanding of the margin to the tolerance limits. The selective copy function significantly reduces the man-hours required for initial setting and maintenance. 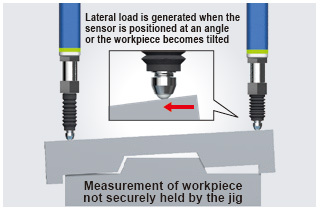 Align with master workpiece and press ENTER key for easy tolerance setting. 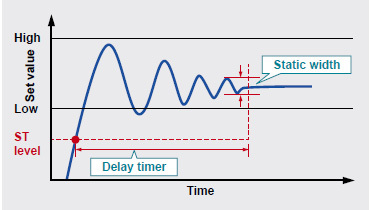 Easy setting of time length from measurement start to measurement stabilization. 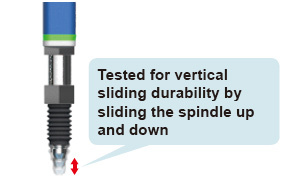 Minimizes measurement fluctuation due to the vibration caused by stopping of spindle rotation. Stability range above the ST level can be set as desired. Set the range where measurements are considered to be stable. 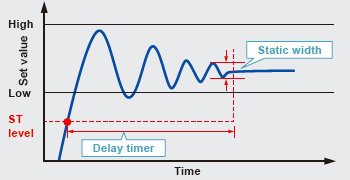 Desired delay time after measurement exceeding the ST level can be set. Set the time required for stabilization of measurement. 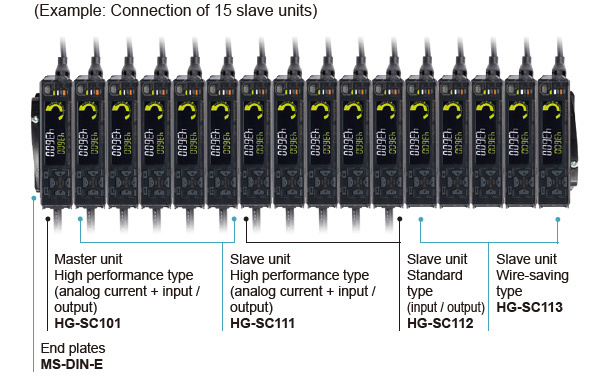 One master unit can be connected with up to 15 slave units in any order. This allows easy multi-point calculations. * End plates (optional) must be mounted on both sides of the controller after the connection of slave units.